Summary: Through the Sea Turtle Nesting Habitat Awareness Campaign, CCC will work with Sea Turtle Permit Holders to distribute educational materials, including table top tents, door hangers and coloring placemats to coastal businesses, hotels, condos and schools and to provide a way for the Permit Holders to award coastal businesses for being Sea Turtle Friendly, with a focus on beachfront hotels, restaurants, condominiums, retail stores, residents and tourists in the coastal areas of Pinellas, Manatee, St. Johns and Walton counties. Results: CCC produced 20,000 “Do Not Disturb” Door-hang Tags, 20,000 Table Top Tents and 20,000 Paper Placemats Activity Sheets (pictured). 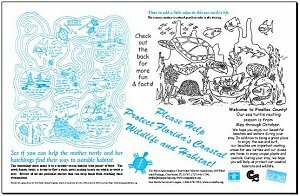 Each target county received 5,000 of each of the three educational materials to be distributed by the local cooperating sea turtle group(s). The cooperating groups were as follows: Manatee County - Anna Maria Island Turtle Watch and Longboat Key Turtle Patrol; Pinellas County - Clearwater Marine Aquarium; St. Johns County - St. Johns Wildlife Care Sea Turtle Patrol; and Walton County - South Walton Turtle Watch.